Many users rely on a VPN service to protect their privacy and to ensure that your data is secure. However, since there is a wide variety of VPN providers, protocols, operating systems and devices, there is a risk of something not working well, leaving your connection exposed. An incorrect configuration, or any type of error, could cause data leaks and make you vulnerable to eavesdropping and online fraud. Unfortunately, the majority of users do not even consider the importance of making sure that their VPN connection is correctly setup. 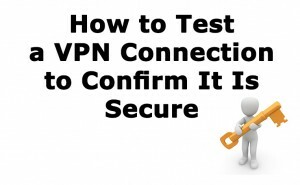 In order to help you verify that your VPN connection is secure, we will take a look at a variety of methods that you can use to check this. One of the things to keep in mind when it comes to security are DNS leaks. These happen when a query from your ISP leads them to your actual DNS, giving them access to your online browsing history. DNS leaks are not uncommon, which is why it’s worth choosing a VPN provider that offers protection against them. To ensure the security of your VPN connection, it is also advisable to use OpenVPN protocol, as it offers a high level of protection. Other protocols such as L2TP and PPTP are not as reliable and are generally considered not secure. That’s why it’s better to opt for a service that supports OpenVPN. The following tests will allow you to confirm if your connection is actually safe. Checking your IP address is the first step to find out if your VPN connection is working correctly. Websites like whatismyipaddress.com or ipchicken.com can help you to check if your IP address is being masked or not. An IP address that matches your actual location indicates that the VPN connection is not keeping you protected. You can also run an extended IP address test. This allows you to check if Java and Flash are also protected by the VPN or if there are DNS leaks. Website whoer.net/extended will offer you a detailed report of connection information that is being tracked. You can use dnsleaktest.com to quickly check if there are DNS leaks affecting your VPN connection. Just connect to the VPN and visit the website to start testing. The results of the test will allow you to check IP addresses, DNS hostnames, ISP service and country. If the information shown matches your actual connection details, such as ISP and location, there are definately DNS leaks. Since many users rely on a VPN to access Torrent websites, testing for P2P security is also important. As a first step, visit Ipleak.net to verify if your actual IP address and DNS. You will need to download the test file with your P2P client and open it to review the IP information. There are plenty of ways and tools to check your IP when downloading torrents. If you have leaks after finishing the tests, there are several fast and simple solutions to help you. For IP address leaks, you should first check if your VPN service is active and then do the test again. If you get the same results, close the application and connect again to test once more. If the test continues showing a leak, this would indicate that there is an issue with the service itself. In that case, you should contact your provider’s customer support to get it fixed or request a refund if applicable. As mentioned, when it comes to DNS leaks the best option is to choose a provider that offers protection against them. If you find Java or Flash leaks after the extended IP test, check if your VPN connection is actually open. Close it, re-launch it, test again and if you still come across leaks, get in touch with the VPN provider. It’s obvious that the service is not protecting you as it should. In case leaks appear while you are testing the IP address on the P2P torrent, you would need to check the ports being used for the P2P connection. They should aligned with your VPN service, otherwise, take a look at your VPN connection and make sure that it is setup correctly. If after checking everything you still get leaks in the test results, consider changing your IP provider as your current service may not be offering the level of security and reliability that you need. If your VPN service does not pass the DNS and IP leaks, it is not keeping your connection secure and it is failing to fulfill its purpose of protecting your privacy.